My road to managing products and growth was a winding one, but I’m glad to see that the ideas I’ve been learning, developing and practicing over the years is becoming standard business practice. I recognize that a lot of my work is still pretty niche, but as more people are exposed to the world of user growth, more of them are showing a desire to apply that approach to their businesses. Adopting what I call the “growth mindset” requires tackling topline and bottom-line growth as an interdisciplinary practice. My personal and professional backgrounds contributed to my tendency to see the world through many mental models. 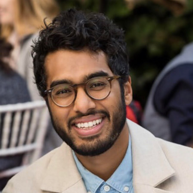 I was born in Bombay, but grew up in New Jersey and was acutely aware of the juxtaposition of those two places in terms of economic development, politics and culture. I wanted to be a neuroscientist in college because I was so interested in the combination of the scientific method and the study of human behaviors. I found the application of these ideas within the business context to be more rewarding; the velocity of the business experimentation feedback loop has allowed me to immerse myself in multiple sandboxes. I started learning the true value of user growth frameworks as I worked through a handful of startups, constantly learning and iterating on ways to grow a business. One of these startups was Dia&Co, a personal styling service for women sizes 14+. I started the growth team and scaled Dia&Co’s customer acquisition and retention strategies. The team developed a digital community playbook and created a viral growth engine focused on maximizing lifetime value and minimizing cost per acquisition. This helped scale Dia&Co to now over 4 million users and over $90 million in venture funding. Now, I am the founder of USONIA, a holistic growth auditing platform and service for customer growth. The business focuses on generating profit at scale through the growth mindset. I have worked with a wide range of companies — from public to preseed —and in starting USONIA, I’ve helped shape the strategy and implementation for CPA, LTV and user experience maximization. I’d like to share a few thoughts on the growth mindset and holistic user growth. Part of what drew me to study and develop growth systems for startups was the appeal of using a scientific approach to problem solving. I like a methodology that allows you to work through a problem by starting with a hypothesis, moving through a set of expected outcomes, developing and implementing an experimental design, and then seeing the results in real time. I find that kind of feedback loop really satisfying. Growth systems provide this feedback loop, and—because behaviors are constantly shifting—the details of how you think through each problem are always a little bit different. It makes for a very creative, innovative, and intellectual discipline. To build an effective and efficient growth engine, I start a foundational framework to assess and prioritize growth opportunities. This assessment must be integrated across all functions because growth sits at the intersection of all other elements of your business—marketing, technology, product development, data and research. When it comes to assessing growth, there are four building blocks you need to look at: retention, virality, onboarding, and user acquisition. I call this the growth pyramid. 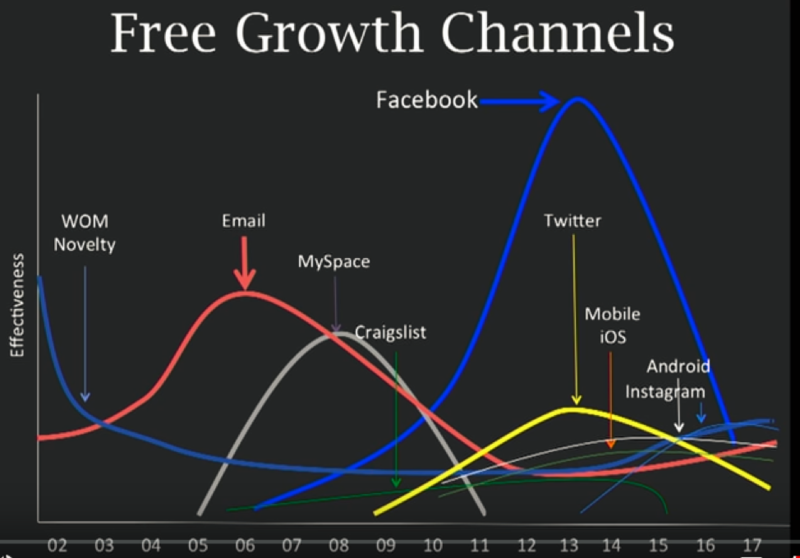 I look at these four key growth levers through the outputs of LTV (lifetime value), CPA (cost per acquisition), and user experience. I want to see how each block is working on its own and in unison with the other three. Growth Audit: In which I analyze multiple data sets and interview key stakeholders to generate recommendations and models to help the business uncover the biggest growth opportunities. Testing and Validation: In which I develop a growth roadmap based on using hypothesis-driven experiments across a variety of channels and tactics. Ongoing Support: In which I provide long-term advisory services to keep the growth on track and supported within the organization. Throughout the process, I am looking for inefficiencies in the existing system and finding ways to turn those inefficiencies into value for the business and its customers. In addition to the general misconceptions about what actually drives growth, I often find that companies misunderstand the big-picture context of product-market fit. Product-market fit is a term discussed all the time. 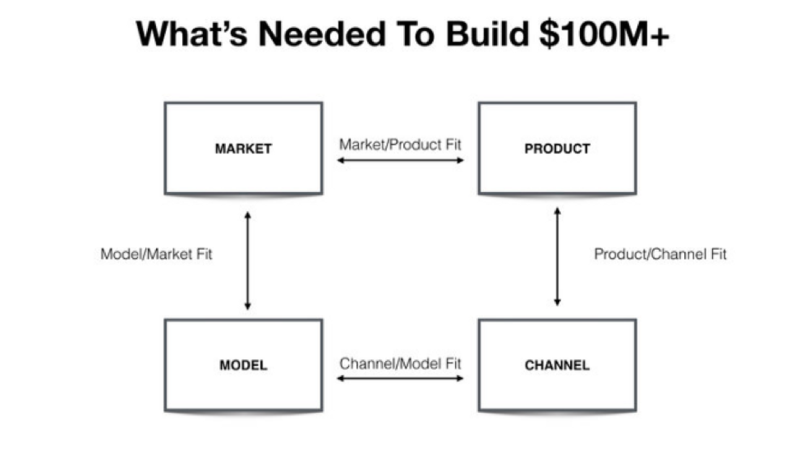 I know it’s a critical component of growth, but what many companies fail to recognize is that “product-market” is only part of the fit equation. To grow your business to $100M+, you have to achieve the right fit in each of these areas. The challenge is that the relationships between these elements is always evolving, meaning that the fit that worked yesterday may break tomorrow. The key to succeeding in all four quadrants is to build for things that already exist. Anthropologists know that it’s easier to build on top of existing habits and societal behaviors—to fit into an existing and accepted routine—than it is to try and force people into a new behavior that sits outside their normal existence. It’s the same with software products. Instead of starting with the product or service you want to sell, start with looking at the platform you want to build from and uncovering the unmet need that already exists. Shift your focus from internal (what you’re building) to external (where is there an existing opportunity to fill a gap). Solving for cognitive thresholds is critical. Given the unprecedented pace of technological adoption in the last few decades, we are observing so many new behaviors that encounter various forms of friction. Growth comes from identifying these friction points and lowering the cognitive threshold towards true value. Talking about building on top of existing infrastructure—either physical or behavioral—another powerful strategy for growth is stackable virality. As search-based platforms expand to massive scale (think Amazon, Airbnb GrubHub), new ecosystems are springing up with viral networks that create valuable product-channel fit opportunities for innovative companies. The idea is to build your product-channel fit on top of existing high-volume, high-intent, low-cost distribution channels. The potential is immense and always expanding. Consider, for instance, that there are eight different one-billion-user Google products, and any one of them is a potential gold mine of a distribution channel just waiting to be discovered. All that’s needed is the right model. But even without looking to the future, there are plenty of examples of stackable virality that clearly demonstrate the value of this strategy. Take PayPal and eBay. PayPal stacked itself over eBay and reaped the benefits of an already thriving ecosystem that was built for transactions. PayPal was able to recognize the opportunity to serve eBay’s middle-America, auction-loving audience (which was completely different than the payment app’s original target audience of affluent and professional early adopters), and were able to take advantage of eBay’s viral nature to drive exponential growth. You do have to be cautious, however. Not all such relationships have happy endings. The symbiotic relationship between Zynga and Facebook, for instance, didn’t last very long after Facebook deprioritized its apps. Zynga, which had driven early growth through a series of apps built on the social network’s platform, was unable to transition to another platform and that proved to be their downfall. It takes some experience to accurately read data in a way that will allow you to formulate a solid growth hypothesis. Often, because the process and language is new to the company, the key performance indicators (KPIs) are not clearly delineated so the metrics you’re aiming to move might also be a little fuzzy. You need to have a clear understanding about cause and effect—what will happen when you change this or that. On a related note, it’s easy for a company to miss the mark when trying to determine which efforts will have the biggest effect—which lever to pull. 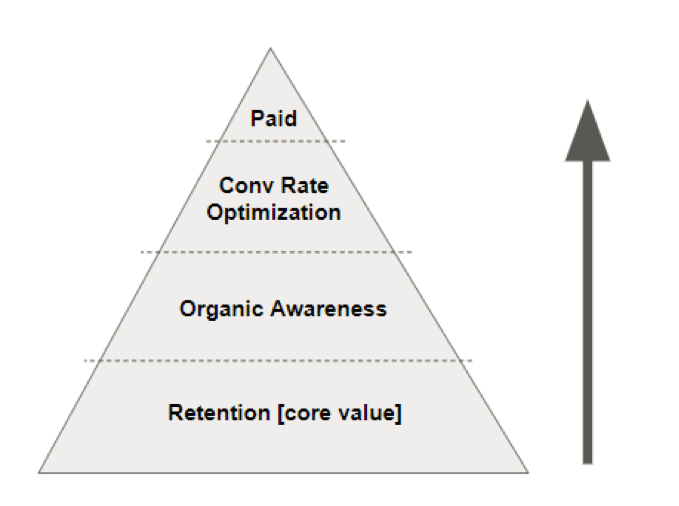 Should you focus on improving the click-through rate or increasing the conversion rate? Will it have a better bottom-line outcome if you improve the active cart rate or the checkout rate? What difference will it make if you achieve a 10% incremental improvement at the top of the funnel versus the bottom? It’s important to model these scenarios out thoroughly so you know where to allocate your resources for the best ROI. This is another area where experience matters. Even if the company is able to determine that their best move it to increase click-thru rates by ten percentage points, they may not know how to design an experiment to validate the hypothesis. And if they can’t set up the test properly, they won’t have enough data to make follow-up decisions with any conviction. Finally, a good test is one that’s repeatable and scalable. While it might be exciting to pull off a really successful ad hoc test, I will always prioritize my time to pursue the thing that gives me half the result, but can be repeated ten times. Because each growth case is unique, it’s hard to give universal advice. That said, it’s always a good idea to think about different time horizons when you’re thinking about growth. You will have short-term wins and long-term wins. Most of the time, founders focus on the short-term because they are most concerned with getting to the next day or week or month. But there’s a lot to be said for taking what I call the 5% challenge. Go ahead and allocate 95% of your resources, time, and money into staying on top of your short-term objectives; but take the remaining 5% and put that into making longer-term bets. Spend some time thinking about what’s next, what’s just emerging that could make a huge difference for your business. What’s new used to be things like community and podcasts. Now it might be streaming TV. The law of diminishing returns is real. To stay ahead, you need to be ready to jump on the next big thing before the other business does. Research is a function that’s very underutilized in most companies. It’s my job to think about these things day in and day out, but most companies aren’t asking the hard questions about their customers. Every company should have a head of research who can give the organization a qualitative understanding of the market, the competition, and the customer base—all at the same time and in relation to one another. The beauty of the 5% challenge is that it’s only 5% of your budget. It’s a small enough amount that if the risk you take doesn’t pay off, it’s no big deal. On the other hand, if it does work, that’s the clinch. You’ve found an inefficiency. You’ve found a stackable virality play that no one else has discovered yet. At that point, the sky’s the limit. © Copyright 2010-2019 OpenView Venture Partners. OpenView® and OpenView Labs® are registered trademarks that are used under license by OpenView Venture Partners. All Rights Reserved.